I've created this special feature for the print media and broadcasters ("Page Nine" regardless of where it runs), that covers stories afresh, not the way news rooms typically flavor things. It will help reduce the distrust so many news consumers feel and could be the most avidly followed item you carry -- if you carry it. It certainly is well received by my audience. This casual sample might make you say, "We'll NEVER run that!" but Page Nine is built around ad revenues from clear-thinking mainstream businesses. Computer overhauls scheduled here have delayed some news and some orders. I'm working as fast as I can, most everything back to normal, thanks for your patience. New Traveler's Guide shipping rapidly, backlog now gone. Thanks again for understanding. Alan. and torn down by the city of Phoenix! plus -- full size billboards are popping up around the state. "AFTER YOU SHOOT -- Your gun's hot. The perp's not. Now what?" A deadly loophole in national self-defense law is uncovered and exposed. Multiple solutions are presented, some of which could work for you or your state. A fascinating easy read, reviews have been exceptional. Find out what your options are, more than 70 experts had input, five different solutions are proposed, this self-defense loophole requires national attention and deserves your support. Get your copy without delay. After You Shoot: Your gun's hot. The perp's not. Now what? The 2011 book is now in stock and shipping, the delays and computer problems are over, get yours now. More than 50 changes in this edition, plus it now includes rules for restaurant carry, and greatly expanded front matter with requirements with police during a roadside stop, motorcycles and much more. The Traveler's Guide provides the only nationwide ranking of gun freedom in the states of the Union. The book has increased the rank of Arizona to 99%, which corresponds closely to the Brady Center to Promote Gun Violence's ranking of freedom suppression, which places Arizona near the bottom of its so-called report card. Arizonans, proud of the Brady rank of 2 out of 100, are pressing for a perfect zero score, with bills now in the legislative process. To keep up with Arizona's innovative proposed statutes, follow the action at the Arizona Citizens Defense League, http://www.azcdl.org. Changes to the freedom ranks of other states have been made as well. A new set of firearm-safety rules has been introduced. The classic gun-safety rules used nationwide for decades were designed for two main purposes. First are the safe-gun-handling and accident-prevention rules that all new students get drilled into their heads. Roughly, these include: always assume it's loaded, point in a safe direction, and don't touch the trigger until ready to fire, along with many others of a similar nature. The actual wordings vary depending on the source. Next are the gun-safety rules for surviving an attack. Less widely known, these are nonetheless critically important to an innocent person, the police, or anyone in combat who must depend on firearms to survive. 1 - You must have a gun. 2 - Your gun should always be loaded and ready to fire. 3 - The first hit counts more than the first shot. As with the classics, numerous versions and different rules circulate. The first rule is sometimes expressed as: The best gun is the one you have. A third set of gun-safety rules has now been proposed in a new book, "After You Shoot: Your gun's hot. The perp's not. Now what?" released in November. 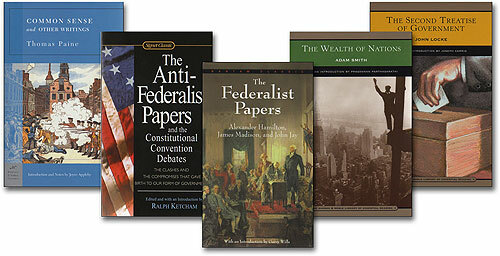 The publisher, Arizona-based Bloomfield Press, is the nation's largest publisher and distributor of gun-law books. Author Alan Korwin points out that, "Many people don't fully realize that if they shoot in self defense, even in the most pure and perfectly clean case, they can face murder charges and an onslaught of legal troubles that may be worse than the criminal assault they survived." "After You Shoot" is focused on how to survive the legal threats and aftermath an innocent victim faces. The bottom line according to Korwin is that, "It's always better to avoid a gunfight than to survive one." 1. If you ever shoot in self defense you must prepare to defend yourself against execution for murder. 2. When you drop the hammer plan to cash in your life savings for your lawyer's retainer. Avoid this unless your life depends on it. 3. Sometimes the innocent get decent treatment, sometimes they don't. 4. It's always better to avoid a gunfight than to win one. 5. If innocent life doesn't immediately depend on it, don't shoot. And if it does, don't miss. 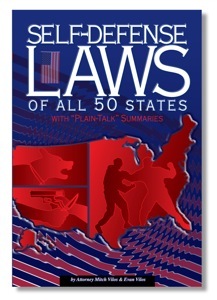 The last rule has been included in Korwin's state-by-state gun-owner guides for at least a decade (https://www.gunlaws.com/books.htm), as part of the chapter on self defense. It is a single sound-bite-sized summary of all the law on self defense. "After You Shoot," released in November, examines the right of a defendant to remain silent and to have an attorney present prior to and during any questioning. Both rights are lost by calling 911 after an incident and talking into a police voice recorder. The book also looks at how lawyers handle self-defense cases, the differences between how police and the public are treated in similar situations, and how people can avoid convicting themselves after surviving a deadly criminal assault. Laws, Korwin says, could be better drafted to do more to protect the innocent. His home state of Arizona has done much in this regard, with a defensive display statute that protects a person who draws but doesn't fire a gun in self defense, and a 911 Limited Immunity statute now in the works, which was introduced in the new book. Title: After You Shoot: Your gun's hot. The perp's not. Now what? [Backgrounder: Scottsdale, Ariz.-based Bloomfield Press, founded in 1988, is the largest publisher and distributor of gun-law books in the country. Our website, gunlaws.com, features a free national directory to gun laws and relevant contacts in all states and federally, along with our unique line of related books and DVDs. "After Your Shoot" for media review is available on request, call 800-707-4020. Our authors are available for interview, call to schedule. Call for cogent positions on gun issues, informed analysis on proposed laws, talk radio that lights up the switchboard, fact sheets and position papers. As we always say, "It doesn't make sense to own a gun and not know the rules." Alan Korwin is the author of 13 books, so far. His next book, about free speech and all the things you can no longer say, is entitled "Bomb Jokes at Airports" and is expected out soon. Thank you for all the positive comments about my two appearances on the Parker Spitzer CNN news commentary show last week. CNN and its left-leaning audience have not heard or seen anything like this in a looooonng time (though I was wearing a suit and tie, which almost no one sees very often). They got a full dose of truth, facts and logic about firearms and gun rights, instead of the more familiar wacky ranting, ignorance, intolerance and lack of respect for this fundamental civil right, which usually describes CNN's coverage on this critical American topic. But don't take my word for it, see for yourself. Here are the links to that and a few other choice shows, including the Canadian Broadcasting Corp's humiliating shellacking a day earlier. I wish to thank you for your superb defence of firearms ownership, and your skillful handling of an obviously biased 'journalist'. You articulated your position and countered the ludicrous objections by an employee of our disgraceful national media outlet. Well done! Please know that millions of my fellow Canadian gun owners are with you, and wish you all the best as you and others fight for our rights and freedoms. --M.V. I heard your interview on the CBC in Canada and I must say that the CBC doesn’t represent the average Canadian. They are a remnant of the Liberal government in Canada and need to be shut down. I am embarrassed at the ignorance of the CBC and I must congratulate you for dealing with the ignorance as professionally as you did. Our gun laws are draconian and as gun owners we are continually under attack in the liberal media, including our government funded CBC. --B.Z. I don't know that you'll receive this email, but I wanted to thank you on behalf of Canadian firearms owners in regards to the radio interview you provided to the CBC after the Arizona shooting. The Canadian CBC has always been a leftist anti-gun organization funded on tax-payer coin, and it was a treat to hear the interviewer put in her place. --W.M. The CBC (Communist Broadcasting Corp) in Canada is anti-gun and anti-freedom but unfortunately most of the sheeple of Canada are too stupid to see other wise. Keep up the good work. --B.H. "I don't know how many times my jaw dropped listening to Mr. Korwin's positions on gun laws. It hit the floor when he stated his belief: 'More guns, less crime.' I must say, I feel for Americans who find this reasoning as ludicrous as I do. Where does one stop? Do Americans outfit their children with firearms for protection?" "I'm a gun owner and hunter in Minnesota. I wanted you to know that Mr. Korwin does not speak for me. I think Arizona's conceal-without-a-permit law is moronic, and has so far resulted in six people's deaths." CBC may not have me back very soon, but CNN tried to get me to leave the SHOT Show, change my flight, stay over an extra night in Vegas, to do another segment. I had to turn them down, but I think we'll be doing more. Stay tuned. A record number of outdoor and sports media people were in attendance (2,074), with more than 57,000 people overall, but the lamestream media could not be found at the show. They must have been tired from their non-stop Las Vegas coverage of consumer electronics show gadgets, which are obviously more important than fundamental constitutional rights and our safety. The economy may be slow in some places, but this industry is doing quite well thank you. The gap is unfortunately widening between government police armaments and the gear available to the general public. The law-enforcement segment of the show had battle gear, armor and high-tech weaponry that was so far advanced from commercial offerings it was like being in another world. While it's true that our front line law-and-order forces can use such armaments against gang warfare and organized foreign hostiles in this country, the implications for crowd control, civil disobedience and the growing absence of Officer Friendly were terrifying. Bulging-muscle guys in spandex t-shirts and battle gear were comfortable amongst each other, a dominating presence for mere civilians who wandered through that part of the show. Is Officer Friendly a thing of the past? Innovative targets are changing the shooting sports. Eye candy is a big part of the SHOT Show. full-auto crowd-control and gang-removal device. The show is overwhelming in every respect, from the gear to the gals to the shoe leather you leave behind as your dogs bark by the end of the day. Unwilling to let my feet slow me down, I joined several dozen key players in the industry at the private United States Concealed Carry Association steak dinner. These folks are growing fast and doing so much for gun rights it's hard to express. While some of the big dogs get the attention, grassroots guys and entrepreneurs like these, operating lower on the radar, are constantly breaking new ground and expanding the boundaries. You should check them out -- and if you carry discreetly, you need to know what they know. http://www.usconcealedcarry.com. Also, tune in to Armed American Radio, Mark Walters rapidly growing network http://armedamericanradio.org that, like stalwart Tom Gresham's Gun Talk, http://www.guntalk.com, and Charles Heller's Liberty Watch Radio, http://www.libertywatchradio.com, is 110% freedom and getting the news out the lamestream media suppresses. I'm in a rarified segment of the SHOT Show, as a buyer (always looking for good new products for my customers) also a vendor seeking outlets and exhibitors who want innovative new products themselves, and as a member of the press, covering the show from a news perspective. This year we introduced our next book to the overseas market, to mixed reactions -- no one has ever seen anything like it before. In most countries, the gun laws are virtually unknown, and people get by on word of mouth, scuttlebutt from their local dealers, rumors, and a wing and a prayer. 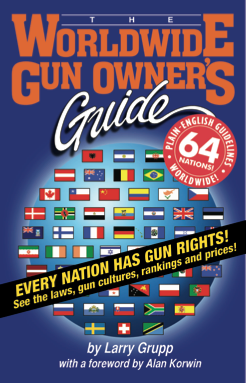 The most important facet of the upcoming 64-nation Worldwide Gun Owner's Guide is its exposure of the global firearms-enthusiast market and culture. Virtually every nation has gun buffs, and they all struggle for their freedoms. You'll be amazed when you see how broad it is. The book is scheduled for release in March. I'll have ordering information posted soon. Agency experts admit they have no idea how many guns go to Mexico from U.S.
LAS VEGAS -- In personal conversations at the SHOT Show with four high-level Justice Dept. officials, including knowledgeable BATFE experts speaking on condition of anonymity, it became apparent that a commonly cited figure used by the "news" media to attack American gun stores and gun rights is a complete fabrication. No method exists to obtain the information. The agency has no mandate or desire to do so. Even if the information could be obtained or deduced from what few records exist, they would be reluctant to release it to the public and anger their superiors, they say. From the head of the State Dept. to the heads of various departments within the agency, the 90% gun-running stat has been standardized despite it being completely false. --Corruption, incompetence and inefficiency within the Mexican government itself prevents those officials from actually knowing how many guns they confiscate in the first place, from the illegal-vegetable cartels fighting Mr. Calderon's failed war on some drugs. --An unknown number of these weapons are recycled right back into the cartels through bribes and theft, further clouding any numbers that are eventually provided to U.S. bureaucrats. Without these numbers, and ratios or comparisons are meaningless. --Mexico does not release such information in a forthright way to U.S. officials, and what we do get is of unknown quality or accuracy. This makes any comparison or ratio of U.S. traces to the totals mere guesswork with less credibility than a routine issues poll conducted by ideological groups. --An unknown percentage of confiscated-gun information in Mexico is sent to the U.S. for tracing. It is believed to be below 33%, and may be as low as ten percent or less. With no way to know this number, the percentages quoted by American leaders can barely be called propaganda. Only some guns with serial numbers or other markings, which may indicate a U.S. connection are submitted, making the quoted percentages preposterous. --Of the traces actually conducted, which itself is only a portion of the total, officials made it quite clear that while American origin could theoretically be determined for some segment of the traces, determining how many of these are straw purchase and hence from border gun shops is essentially impossible. They cited many reasons for this, including the fact that only the original purchaser can be identified. Guns bought years ago could go through many hands before making it to: a prohibited possessor (a likely source of many of the firearms, they said), an after-market straw purchaser (cannot be determined), theft (only distinguished if the then-current owner filed a report) or other means. The agency does NOT compile such statistics because they realize it would be a fruitless exercise in futility. Among the answers repeatedly given for why the numbers are so bad, why top officials are using the now openly bogus figures, what the chances for future improvement might be, and why they won't publicly admit the truth or confront the leadership and help reestablish a semblance of credibility for the agency, were, "I have no knowledge of those statistics," and "I have no access to that information." Reports surfacing from South America suggest that cartels, overflowing with cash and influence, send truck convoys (not just trucks) to aging military warehouses in Central and South America, stuff them with firearms sent by the U.S. and other world powers over the decades to prop up various banana governments, and obtain more firepower in one load than an army of drug-lord indebted hos can buy on 4473 forms from legitimate dealers in a lifetime. Pictures staged by federal authorities to display captured weaponry, featuring fragmentation grenades, mortars, rocket-propelled grenades (RPGs), 20mm and 40mm cannon shells and other military ordnance not available from any U.S. stores, support the claims that drug cartels hardly need to shop at retail and pay sales tax. Additionally, the ever-popular communist-designed AK-47 and similar weapons might come through the U.S. in some cases, but the point of origin for these is obviously not the U.S., a fact completely ignored among all the fuss. One knowledgeable source believes that less than 10% of all Mexican cartel armaments come from U.S. sources, in the sense of illegal retail purchases smuggled across the border. Some U.S. originated arms, supplied to the Mexican government in an official capacity, leak into the black market as soldiers there desert by the thousands annually. No comments from the White House or the State Dept. have been received or are expected. Tucson shooting this, that, the other, more, still more, Tucson minutiae, speculation as news, guesswork, tangents, endless tongue clucking, microscopic views of anyone who knew anyone, savage attacks on fundamental civil rights. News coverage of anything significant in the entire world was virtually blacked out by news media nationally for more than a week, as a determined effort to sensationalize an assassin's actions took center stage and the entire media industry took part. Any notion that all life is precious and people are equal was bluntly erased as more than 1,000 federal and state law enforcement officials launched into action over the relatively small number of killings. More murders occur in bad parts of major American cities on any given day, see maps here -- https://www.gunlaws.com/GunshotDemographics.htm. But authorities there barely record or announce the details, let alone document the scene, seek motives or track down perpetrators. "All animals are equal, but some animals are more equal than others," an allegorical pig was overheard saying. Watching, reading or listening to “news” reports was virtually worthless after the first few minutes, as the same tripe was breathlessly repeated, often without any changes, and the same images of non-incident-related footage barraged the American public. Tiny new facts emerged slowly and entered the endless loops in print and broadcast reports. Speculation on the murderer's intentions and mental state proceeded headlong with no basis in fact or substance of any kind, self-evident from the opinionated, vacuous and conflicting guesses. The murderer's mental state and sanity are still completely unknown, but this hasn't stopped pundits from punditizing. Commentary failed to note that the standardized image of the murderer, prepared and released by officials and displayed for endless hours, was so distorted from the actual image of the perpetrator prior to the murders, that no human being would be able to pick him out of a lineup. Efforts to convert an assassin into a champion for denial of fundamental civil rights was promptly taken up by the most leftist members of Congress, following former White House chief of staff Rahm Emanuel's advice that no crisis should be wasted. Every old anti-rights bugaboo was dusted off and presented as if fresh and relevant. The attempts were a direct parallel to the 1960s racial civil-rights battles, where a single black criminal would be displayed incessantly to demean and disparage the entire black population, and keep them out of lunch counters and buses. The only true sign of insanity was a hopelessly impossible proposed 1,000-foot roaming gun-free zone to surround designated so-called important people. The national disgrace of the coverage is being analyzed piecemeal by some organizations, but the barrage continues unabated, now three weeks after the event. Buried under the mismanaged news process is, for example, Mr. Obama's support for a plan to create an “internet ecosystem,” where every user will need a government ID code to get online. It was announced the day after the shootings, just by coincidence. "A Centrist Obama To Take Stage, by Peter Nicholas and Christi Parsons, Tribune Washington Bureau. President Obama plans to use his State of the Union speech Tuyesday to articulate a centrist vision that will shape the remaining two years of his term, and provide a template for his re-eelction campaign." Similar reports appeared in "news" media nationwide. In one of the most blatant examples of unmitigated propaganda ever seen in America, Tribune newspapers has dared to call the person currently in the White House a centrist in a headline setting the stage for the State of the Union speech tomorrow. Despite outrageously leftist moves in recent weeks and for the past two years, the man whose actions and self-avowed principles border on direct marxism is described as a moderate. The move is likely to influence many people who cannot think straight but are still able to vote. “Perhaps the editors forgot about his centerpiece health-care takeover, which could only be enacted through chicanery, or all the bills he signed during the lame-politician session just a few weeks ago,” says one unidentified source who refused to be identified. “It's possible,” she said. She referred to the spate of bills enacted by legislators voted out of office before they were actually out of office, and signed by Mr. Obama last month. According to the olden Constitution, a primary purpose of the speech planned for Tuesday is to give Congress a report on the State of the Union. No mention of any such content was made in "news" announcements, which were mere repetitions of handouts given or leaked from inside the White House, and the apparent source of the word "centrist." No reporters asked about the constitutional element of the speech, and none are expected to ask about it after the speech. In other news, despite assurances from the new governor of Hawaii to out the sitting president, no new information has been released regarding Mr. Obama's birth certificate, which remains a closely guarded secret, if it exists at all. “The entire controversy can be washed away clean and easy with one simple move," said The Uninvited Ombudsman. “Just show the birth certificate. I can't imagine why he wouldn't do that and end the problem,” the mild-mannered media watchdog said. The administration has released a piece of modern computer-generated paper that claims a Barack Hussein Obama was born in Hawaii, but it is not an actual birth certificate. The hospital where the birth supposedly took place remains a mystery, along with the doctor who supposedly presided over the delivery. Neither the doctor nor the hospital are indicated on the paper the White House approved for release, which has satisfied many people who support the person currently in the White House. "Protecting and expanding the rights of law-abiding gun owners." "Dedicated to promoting the shooting sports. Established 1909." "Mesa's Premier Indoor Shooting Range"
"The common sense gun lobby"
"The world's premier resort dedicated to self-defense and firearms training." "Your source for the gun laws—in plain English and word-for-word"
The world's oldest and largest firearms training facility specializing in self defense. Located in central Arizona. "Dedicated to promoting a better understanding about our Constitutional heritage to privately own and possess firearms." "The woman's advocacy group dedicated to the human right of self defense." hunting, fishing, topos, GPS -- it's map heaven." Do you ever leave your home state? Self-Defense Laws of All 50 States! The complete guide to the self-defense laws in plain English! in more trouble than an attacker? Just look at the Table of Contents. NOW AVAILABLE for immediate shipment (and it's excellent)!! Works for anyone in any state! 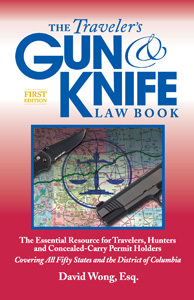 The Traveler's Gun AND Knife Law Book -- for All 50 States! Brand new and five times thicker than the original Traveler's Guide (which is still an excellent resource, now new for 2011), this book covers guns AND knives, restaurant carry, park carry, your rights in a traffic stop, do you have to notify officers, much more, with tremendous detail you could not get before! Get 'em both! PLUS -- If there's no guide available for your specific state, this is the book to own. Get more info on our website. Available for immediate shipment -- now in stock! Arizona is rekindling the idea of a nation of marksmen. ARIZONA TRAINERS -- Be sure to get your free listing -- visit the site. Earlier problems with automated sign-ups have been fixed. "... TrainMeAZ is a no-lose proposition. 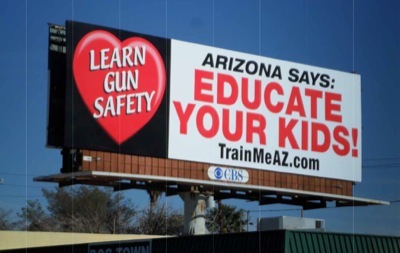 It will promote gun safety and marksmanship as an integral component of American citizenship ..."
On behalf of the five NRA Board Members who make Arizona their home (including two past presidents), we’re asking you to take a stand on gun rights and support the TrainMeAZ campaign now being organized. Our new Constitutional Carry law changes everything. Now that any law-abiding adult in Arizona can discreetly carry firearms, Arizona leads the nation in demonstrated support for the Second Amendment. It’s in your interest as Arizonans, and the nation needs to know, what we’ve accomplished. We have a priceless opportunity to launch “a culture of marksmanship” here in Arizona that can sweep across the country, but it can only happen with your direct involvement. Now that government no longer dictates the training environment, private enterprise and the free market should take advantage and fill that vacuum. This will help your business, build your customer base, and bolster the right to keep and bear arms. By acting as a state instead of separately, we will present an image to the nation that pushes all our independent interests ahead... Read the rest. an enormous advance for our right to arms. Will the next step be full Constitutional Carry? Read all about your rights and responsibilities. the aftermath, plus a 50-state carry guide, truly excellent. Responsible parents take their kids to the range. Gun safety is everyone's business. A main operating principle behind TrainMeAz is to get the entire public on the bandwagon and out to the range. read and wrote. Get the 11 top titles with one easy decision. and you won't even need to get the set. But you'll want to! Buy a batch and give them to friends, ask about wholesale pricing. You get something, we get something, it's more better. 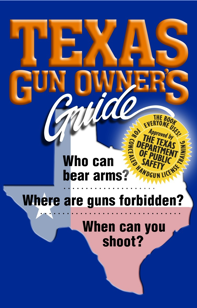 Plain-English state gun-owner guides -- know your laws, stay safe. Plus -- A gun-fight simulator that works on your TV!! It's part of the Armed Response series of self-defense DVDs, truly excellent, take a look, including the gun-fight simulator that plays on your TV! Buy the simulator separately or as a set. Do you want to see what really good gun laws look like? if you plan to carry discreetly or openly. (24th edition, includes the newly enacted laws insert). If you're out of the state, this is an eye opener. You will want your state to emulate what we have here. Only $14.95, or get six at 20% off, or 12 at 40% off. 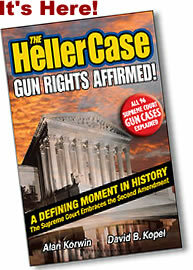 The Heller Case: Gun Rights Affirmed! This first edition of history captures the excitement of "The Case That Saved The Second Amendment." Your rights are crucial, this book helps you protect them. I was there as a guest of the Supreme Court -- eyewitness accounts, the entire case dissected in plain English, summaries of all 96 High Court gun cases. Tremendous reference, fascinating reading. If you're like some folks who ask if they can link to or forward my stuff, the answer is YES! and I'm honored by such interest. You can use the PageNine logo or any art from my site, with my thanks and appreciation. Back in print after years! we have it in stock. This book changed the landscape -- one woman writing for other women, speaking in a voice women could hear, without the macho noise that turns women off. Paxton has been on every newscast you can name. The media hardly knows what to make of a woman who understands guns. Makes a perfect gift for someone you know. I never said that in the first book!